Want a natural, non-toxic, affordable solution to get rid of iron & sulfur in your water? An Ironmax oxidation system is the answer. Air is injected into the system where oxygen mixes with the water. This causes the unwanted elements to be precipitated (forced to fall out of solution) and are then able to be captured in a filter bed. Your naturally cleaned water then exits the system. Why buy chlorine, potassium permanganate, or hydrogen peroxide for use in an oxidation system when oxygen is free? Also, ask a competitor how often the tank(s) need to be re-bedded, how long the warranty is and what it will cost after the warranty is up. We guarantee our media to last 10 years, or we buy it for you. Note: Have your water tested! Iron amounts can range from 0.3ppm to over 10ppm, and your water test will determine the size of system required for your home. 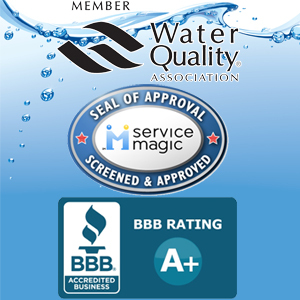 Call today for a free water test performed by our WQA Certified Water Specialists.